AVSVideoConverter is a software for conversion video files ! AVSVideoConverter is an easy to use tool for conversion of AVI, MPEG and Windows Media Video files. You can use it to change frame size, compression codec of video stream, frequency, and the number of channels of audio stream. With AVSVideoConverter you can easily retrieve video files' information, convert them to another format, merge several video files into one output file and extract single frames to image files. Also you can apply a variety of effects during conversion. The new possibility of recording VCD and SVCD is added to AVSVideoConverter. 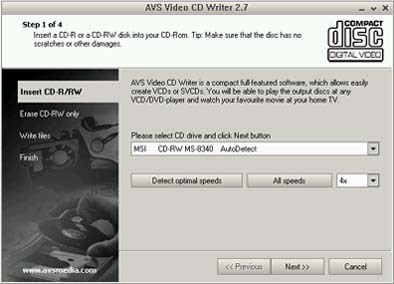 You can convert files of every supported formats to VCD or SVCD and right after that burn it to a CD-R/CD-RW using AVS Video CD Writer application. You don't need to use any additional software to burn a video CD - AVSVideoConverter lets you create it in 4 easy steps. You will be able to play the output disc at any VCD/DVD player and watch your favourite movie at your home TV. You will be surprised how smoothly you go converting your video files from one format to another, applying different effects and filters, cropping your files and adding banners to them. And you can even preview the result to make sure that you have done really what you wanted. RM (Real Networks Video, write only). 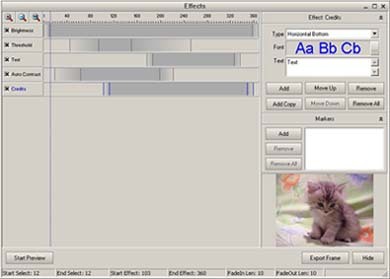 The following video effects can be applied during conversion: brightness, contrast, gamma, equalize, red, green, blue, desaturate, intensity, invert, flip, blur, sharpen, auto level, auto contrast, crop banner, resize and more.